To her partners at Aether Exploration, Ariane Kedros is the daring pilot of their prospecting ship. She is also a reserve major in the Consortium of Autonomous Worlds--accepting mysterious assignments to fulfill her duty. To the Terran Expansion League, she is a war criminal. Fifteen years ago, she piloted a ship on a mission that obliterated an entire solar system. Those involved in the incident were given new identities and new lives in order to protect them from retribution. No new face or name can wash away the guilt Ariane feels, or chase her demons away. 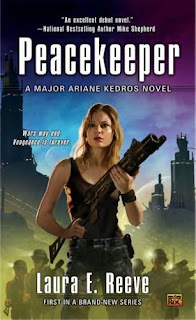 This is the first book in a new military science fiction series. Laura E. Reeve is a former USAF officer and brings both her flight and military knowledge into this debut. Sounds like something action loving Sci-fi fans will definitely enjoy! Darque Reviews has reviewed the book here and had some good things to say about it. The next book, Vigilante, is due out in October of 2009. The author was in the Air Force! I was in the Air Force! However, she was an officer. I was just a jet mechanic. And it sounds like she had some really cool missions. I checked out her website and hey! It has a media kit! She's doing everything right . . . I only have one suggestion, just in case she stumbles upon this post. (It happens!) Include a high-resolution cover image. I eventually found one at Fantastic Fiction, a UK site where I find many of the images I use here. I suppose I'll have to read this one! Thanks for the mention Tia! (It was Mulluane's mention, but you're welcome.) And thank YOU! I'm honored. You are very welcome Kimberly and way to go Tia! This is the second time Kimberley has nominated me for an award! VERY cool. I'll put up my post on it tonight. This book sounds like a lot of fun! I've been wanting to dip into more military SF and so I'll keep this one in mind. Thanks for the rundown, Tia! Blogger Icked Up My Post! Kelly and Colleen Blow Away My Blog Stats! One Year Later Post This Thursday! Wow! And I mean, WOW!